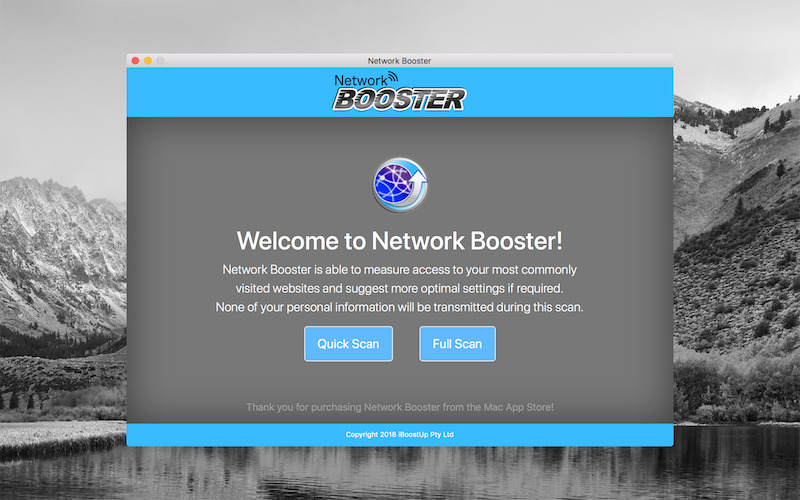 upercharge your browsing speed with Network Booster for Mac. With Network Booster you're only minutes away from a faster, better browsing experience! None of your personal information will ever be transmitted or stored by Network Booster. This is the quickest and easiestway to increase the browsing speed on your Mac, and best of all it's free! Network Booster measures DNS lookup speeds for your most commonly visited websites using your current DNS server as well as other public DNS servers, then compares the average lookup times and suggests more optimal settings if required. Network Booster is able to gather a list of your top sites from Safari, Chrome and Opera. Applied DNS settings will work system-wide with any browser or Internet connected application. What is DNS? The Domain Name System (DNS) translates domain names to the numerical IP addresses needed for locating and identifying computer services. Think of it as the phonebook of the Internet. Whenever you browse the web your browser will perform many lookups to your DNS server. A DNS server that responds faster will result in improved browsing speed. Network Booster maintains a constantly update list of the best, most secure DNS servers from around the world so you can be sure it will give you the most optimal recommendations. Initial Version. Supports macOS High Sierra.